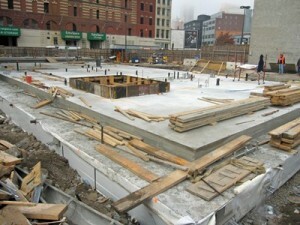 Theatre for a New Audience is now seven months into construction in Downtown Brooklyn’s BAM Cultural District. The 30-inch mat slab has been poured, consisting of 947 cubic yards of concrete. In pursuit of our goal of environmentally sustainable construction, the concrete mixture contains slag, a by-product of steel manufacturing. In addition to being a post-industrial recycled ingredient, slag added to concrete creates a more durable and less permeable material. The aggregate (small stones) in the concrete is also recycled, and all concrete materials come from within 500 miles. A special acoustical slab will be poured next month, and will be followed by the erection of structural steel. Stay tuned in the coming months for more updates!